Leverage Veritext’s easy to use online tools for deposition scheduling, simplified transcript and exhibit downloading, mobile tools, and advanced search capabilities. Our proprietary MyVeritext client portal and Veritext Mobile App enable seamless access to your schedules and transcripts and the ability to search and annotate anytime, from anywhere. Conveniently schedule, confirm or change depositions specifications online. Veritext’s secure MyVeritext Client Portal lets you schedule depositions, specify needs, check status, confirm, make changes, and maintain a central calendar without picking up the phone. In fact, Veritext’s drag and drop snap scheduling feature allows you to schedule a reporter within 7 seconds by uploading a deposition notice. View all of your current and past scheduled depositions, enter all the events of your case for access by the entire team and access the Client Portal’s online document repository and administrative functions. And we’ll send you confirmation notifications before each deposition where you can confirm. Even rescheduling is as easy as moving a calendar appointment from one date to the next with a single mouse click. Search & download transcripts and exhibits online, anytime. MyVeritext lets you and your colleagues download or search for your specific documents, in the format you need or order printed copies without having to pick up the phone. The online repository provides complete document security with secure single user access compliant with HIPAA and PII standards. Once you are registered for MyVeritext, you will have full access to search and download as your transcripts and exhibits. The comprehensive portal provides accessibility and security from any computer or mobile device. Schedule, confirm and review transcripts on the go. Now you can access documents, schedule or confirm depositions right from your mobile device. Veritext Mobile provides robust capability to instantly confirm and review deposition schedules, view details including mapped directions, and download transcripts for mobile annotation. Plus Veritext Mobile is synchronized to your MyVeritext secure repository so you can review full calendars and access all of your transcripts and exhibits. Go from zero to depo in just seven seconds. Veritext’s snap scheduling feature is a lightning fast approach to calendaring a deposition. Simply move a notice from your desktop into the MyVeritext web portal and the appointment is all set. 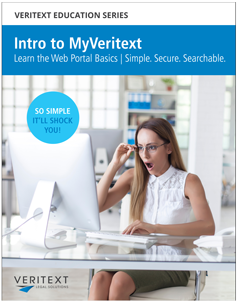 Register for the Intro to MyVeritext Webinar!